St. Anthony, Ora Pro Nobis! words since known as St Anthony's Blessing." with them, to overcome temptations/assaults from the devil. Thank you St. Anthony! Family dog snuck out back door of house this evening [fully dark out]. Realized about 4 mins after occurrence. With 2 family members on foot & 2 in vehicle (all CALLING for him) found pet 15 mins later - totally unharmed! 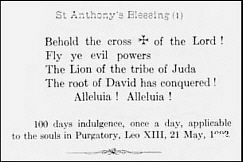 To the faithful who shall say thirteen Paters, Aves and Glorias in honour of St Anthony of Padua an inidulgence of 100 days, once a day -Leo XIII, June 9, I896. Saint Anthony, Hammer of Heretics, Ora Pro Nobis! 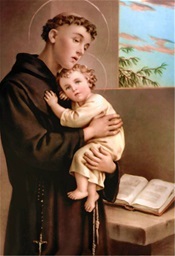 Today, June 13th, is the glorious feast day of the Wonder Worker, St. Anthony of Padua! Make sure you print out (or write down) the St. Anthony Blessing Card on this page, and always have it on your person. "Great Saint (Anthony), Lily of celestial purity, and vanquisher of concupiscence, obtain for me and all thy other clients perfect purity of body and soul."